Mate Precision Tooling Anoka, MN, will make headlines at FABTECH with its new VariBend tool, being displayed performing 90-deg. bends on a CNC punch press. The VariBend flexible, multipurpose tool bends sheetmetal tabs at any angle to 90 deg, adjustable in 1-deg. increments, eliminating time-consuming secondary operations usually performed on a press brake. With a maximum bend height of 0.70 in., the tool is well-suited for presses with upforming capabilities and with stroke control. Also on display: Mate’s Premia automated tool-sharpening system, featuring a touchscreen interface that simplifies tool setup and maintenance operations. 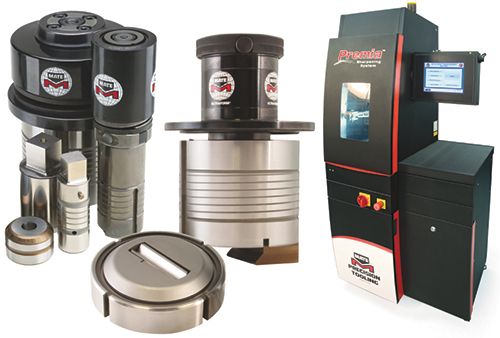 The menu-driven machine includes three standard programs for small, medium and large tools, plus two customizable programs. Use it for all popular tooling styles including thick turret, Trumpf style, Murata Wiedemann, Multi Tool, thin turret, XMT and Salvagnini. Lastly, take a look at Mate’s UltraTec A and B punches now available in optional wear-resistant M4PM steel, for high-performance punching applications. It’s a high-speed particle metallurgy steel that combines the chemical composition of M4, particle metallurgy manufacturing and a triple-temper treatment process.